We were walking slowly home from enjoying some blues/jazz in the park. I love admiring the variety of styles and eras of houses in the historical section we often tread through. However, today I walked with phone to ear, listening to a sad story of a church falling apart. It is the same story heard and repeated much to often these days. Differences in vision and vehicle. Ideas clashing, no one listening, before you know it rumors of "split" and "voted out" spin. My husband and I realized recently, this scenario is just one of the issues God has called us to speak to. When we share God's message of how "It's not about religion, it's about relationship" we realize we are speaking to a wounded nation. One where the greatest injuries to Christians and skeptics have been inflicted by the very institution that sought to convert them in the first place. Aren't we all human though? Don't even families and businesses have their disagreements, their bull-headed uncle Johns and sweet soft spoken aunt Betties clashing over the tiniest details? Why should a church be any different? A building filled with a collection of individuals, ideas for ministry, ideas for reaching out or pulling in... swirling around one big place. My husband and I have a hard enough time finding middle ground on certain details and we are just two people... how could a whole congregation (or even just a church board). I think it starts with listening and hearing. I think too many people get full of their own ideas and don't want to compromise. I mean really compromise which requires a person to completely let go of self. Call it pride, ego, absence of humility, or even simply the presence of humanity. Whatever you want to call it, when a tug-of-war ensues... someone is eventually going to loose. What if everyone set down their end of the rope and walked to the the edge of the pit and talked it out? It isn't just churches though, it is families, friends and even communities. No one wants to completely let go of self and hold onto God for the outcomes. It is this lack of trust in Him who is greater and our tendency to cling to what is less. Like sand through the fingers, we never truly have a hold when all we are really reaching for is self. After I hung up the phone, the kids and I took a path through the park and by the gazebo my husband and I were married in...only that gazebo is gone. 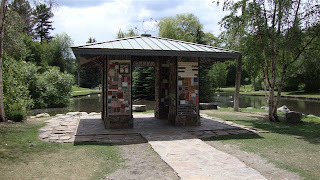 It was torn down about 6+ years ago and replaced with a new structure: a small pavilion covered in tiles created by community members sharing messages from many different belief and age groups. ... and mountains and groups more secular. Standing among the four pillars I felt a sense of true community. I may not agree with all of the beliefs portrayed, but I can agree we are all children of God... even if some members of the Family don't acknowledge it. Here they are, drawing together for one commonality, setting aside differences to focus on similarities: the beautification of a park. Why can't the church do that? The members of one church or even the churches of one community. Set aside differences, humble themselves to let go of themselves and reach out to beautify the hearts of man. After all, isn't that what Jesus told us to do? So why can't we? Even I have to remind myself to reach out. To give food to the less fortunate, to share a message even with the def, to walk the extra mile even if it means the person I seek to reach just runs farther. I must let go of myself, my judgements, my presumptions and rest only in what God sees: the hope for a Kingdom in the hearts of all mankind. It isn't even about you. It is about God and what we are willing to let go of so we can hold tighter to Him. That is what I am working on, that is how I am seeking to humble myself, that is how I wish to feel God closer. Such sweet and true words. While it should be about God....humans are the ones running the churches and visiting the churches...and we're all sinful. Most trying to grasp the true reality of God the creator, the light, the word spoken in the dark, creating all of and through the light...the gift, that precious gift of the one who created us hanging on a cross...grasping that is mind boggling and, then seeking the transformation that only can come through his sanctification...it's a long process...a dirty one. 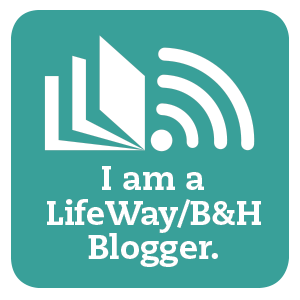 I so love your blog(s) and the way you make me think. We are hoping to bring a speaker to our church,but are hitting some walls. We understand them...but, still keep knocking in loving and gentle ways. Thank you for blessing me with this...it's a good reminder! Rebecca, My soul is blessed to know these words could ring with you today. Thank you for your words and encouragement. Feel free to use these comments with those you feel they would touch. I may need to very soon as we have been called to intercede in some respects on this issue. If you think of it, pray from now thru Sunday that humility and peace will work in the alluded to church above. God Bless you! I always love hearing your thoughts! It is hard to walk in true humility and set agendas aside to really listen! I read an article in the paper today about some issues between local elected officials. Like you mentioned, that's just one of many examples, including some in my own home. Thank you for reminding me to really listen to others. Jennifer, you are very welcome. 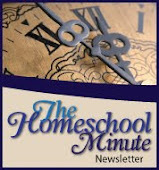 I think no one is immune to the need from time to time to set aside self, yet it is so hard to do. I need to remind myself regularly of this :-) I am thankful God could use this message to inspire you today.